In addition to the Ferdinandos; Kenny Wollesen, Dan Reiser, Tony Scherr, and Tim Luntzel, the album features guest appearances by Norah Jones, Bill Frisell, Steven Bernstein, Rob Burger & others. Van Dyke Parks contributes string arrangements on four songs that were performed by the Soldier String Quartet. 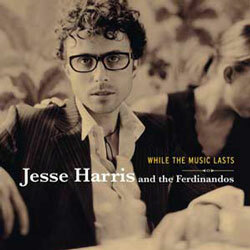 The album was recorded and mixed by the legendary Terry Manning. Click on the mp3 icons to hear the songs. Remember feeling like going home? Waiting for the sun to rise? But why am I still waiting here to leave? Out there by yourself alone? No one but yourself alone? Round and round going nowhere? Up there in the clouds so safe? Round and round landing nowhere? Out there by yourself alone, alone, alone? What’s this silence from within? What’s this darkness in the sky?